I met artist James McLeod at a friends card party, and right away his mix of New York savvy and N. Carolina (southern) charm intrigued me. However, being somewhat shy of new people (yes it’s true) I was not being much of a conversationalist. Thankfully, the gal sitting on the other side of him was not shy. She, like him, was an artist and they struck up a conversation that eventually lead to James pulling out his cell phone to share pictures of his work. I was amazed, and hooked. His life-like sculptures looked ready to leap out of his phone! I contacted him a few days after the party and thankfully, he agreed to speak with me. We enjoyed a chat at a local coffee shop, and the more I learned about him the more impressed I became. Down-to-Earth, warm, and funny, James McLeod is as wonderful a person as he is an artist. Keep reading to learn more about this incredible multi-media artist / Renaissance man. SnS: Hello James and welcome to TheSquidandSquirrel. I understand that you are not from the PNW. How did you come to call Spokane home? James: Well, I actually grew up in New York, but a few years ago I injured and re-injured my back and couldn’t walk or work for about a year. I lost everything, but I had corrective surgery and once I got back on my feet I had to start all over. So I had a cousin living here in Spokane. He said, “Yeah, this place is great. Why don’t you come check it out?” I told him I was at the end of my budget so if I came I’d have to make it work. I showed up with $400 and a suitcase. That was five years ago. SnS: Wow, brave! What or who got you started creating art? 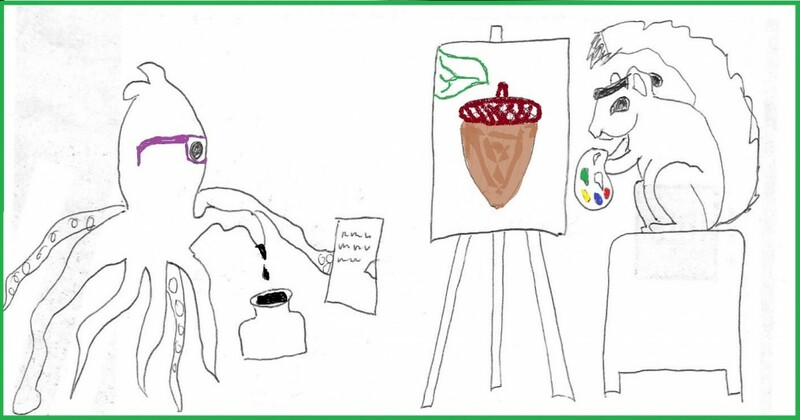 James: I’ve always been an artist. When I was four years old I made my first sculpture out of pipe cleaners. I made the big bad wolf. I can remember it like it was yesterday. He had legs and arms and feet, green pants and red suspenders. He was lighter around his mouth and his tail was extra fuzzy. I’ve been creating ever since. Also, growing up in NY I spent a lot of time in museums and if you go to Manhattan a lot of the buildings are very sculptural. They have a lot of lions and people and muscles and all that kind of thing. I was forced to go to Broadway and off-Broadway plays and every class trip was to a museum, or something to that effect. So I was inundated with fine art, and that level of exposure had an effect on me. SnS:. Cool. What is your favorite medium? James: As far as medium, clay sculpture has been my thing for a long time. Now that I’m going to school I’m getting opened up to a lot of different things. Before this I was self-taught, through observing life, and other sculptures. Now I’ve dabbled in acrylic painting, and I’m not sure what to call the style. It wasn’t realistic in any way shape or form, but you knew it was human. You could identify what it was, but it was very folky, so I put it down. That’s not good enough for me. SnS: You’re a perfectionist at heart. James: Yes. My goal for my artwork is that when you see it, it should have a life. If it’s a thing, it should look like it’s going to get up and walk away, or at the very least you should see it thinking. That’s my goal when I’m creating anything. I’m really getting into oil paint now. I took an oil painting class and found I have a gift for it. That’s the biggest thing about school to me right now. I’m being exposed to all sorts of things I hadn’t done before. I’m getting just enough instruction to take it and run with it, and I have plans to do a series of politically influenced works dealing with various aspects of activism. In school I’ve kept my subjects fairly sedate so that I don’t ruffle any feathers, but I’ve been told to take my hands off the wheel and run! So that’s what I’m going to do. I’ve also gotten involved in bronze. I’ve always wanted to work with metal and the piece I showed you was my first bronze. I’d like to do much bigger pieces but with what’s available to me right now, in terms of tools and kilns I can’t go too big. I would love to have a kiln the size of this building and make pieces that big. So that’s a goal. I’ve also done a little 3D design, but it’s not really my thing. My focus is the imitation / replication of life. Not just the angles, but also the feeling of it. I’ve seen people who are technically perfect who could sculpt you perfectly, down to the eyelash, but you know it’s a statue. There’s no life in it. So I try to incorporate both perfection and life. Sometimes I make things a little bit stylized to give life to it because nothing in life is perfect. Sometimes when you cartoon it a little or give it an imperfection it makes it more lifelike. That’s the only departure from realism that I’ll do. SnS: Have you had a mentor? James: That’s hard to say. Yes and no. There have been people along the way that have fed into my box of tools. But I’ve never had a “mentor”. Tybre Newcomer has been helpful and was instrumental into getting me the position in the sculpture studio as the tech. I get to help the students, which is a big opportunity for me because it helps me to hone my skills. It’s also made me more patient in terms of their learning process. No matter the skill level, whether a Picasso or Joe Blow from around the corner, if you put effort into it I’m ecstatic and I can show you how make it look like what you want to see. When you articulate to me what you want to see I can help you get that regardless of your skill level. There was also a lady, Maryanne, in Colorado Springs, CO who gave me my first sculpting job back in 1996. In her studio I made animals, because she wasn’t good at that. So I made buffalo, chipmunks, and wolves. I also made generic people in proportion so that she could then take them and make cowboys or Natives to fit her Southwestern theme. SnS: Some artists have a creative ritual, like listening to music, going for a walk, or rearranging their studio before they can work. Do you have a ritual that helps your creative juices flow? James: Do you see this thing right here? *He holds up an Iphone with ear buds attached* That’s what I do. I listen to music, tune everyone out and I just work and listen. Listen and work. Dance a little bit. SnS: So who do you listen to? James: Oh Lord, I have a big playlist. I listen to a little dance hall reggae, soul music, and jazz. My favorite singer in the world is this lady named Ledisi, I’ve been following her since she was a regular person. She had been singing at the Blue Note in the Village in NY, and after I left NY I’d still go up there to get autographed CDs and now she’s really famous. But I love her. There’s nothing she can’t do vocally. From the highest high to the lowest low. She’s phenomenal. But yeah, so mainly I listen to soul, jazz, a little bit of Journey. SnS: You just won something in school. Tell me about that. James: Yeah, so excited! There are 2 classes you have to take before you graduate as an Art major. One is Portfolio, where you take your ten best pieces, write a bio for yourself, do a resume, get a professional photograph of yourself, and do a Power Point presentation. Then every art professor gets in a semi-circle around you and your work and they critique you. They are very to the point. They don’t try to make nice, so none of that “Oh he’s sort of frail emotionally”. Oh no. So I got a lot of good feedback and it was a unanimous decision from all the teachers. Of course, they told me that they didn’t like the orange I used. But I like orange. I don’t care what they’re talking about. The orange is sort of an invitation into my world. It’s telling you that I’m in there and I’ve got more for you to see, so I won’t listen to that one. Still, I won Portfolio and a $250 scholarship. SnS: Congratulations! Are you going to display the ten pieces you made? James: I’d love to, but I need to get ready for (SFCC) Exhibit, so I’m hoping to be able to make more things, better things for that particular show. Right now though, I only have 2, 3, or 4 of a lot of different mediums. I’d like to create a more cohesive group of items that have some type of theme before I show. I don’t want to have a Dollar Tree sort of show. SnS: Understandable. So, what are you plans after school? James: I would love to open an art school minus the art history. To me that’s a waste of time. Those people (famous artists in history) are glorified and seen with rose-colored glasses, when usually they are insane, on drugs, or whatever but we’re taught to think they were these awesome people. My only interest in them are their techniques. So the school I want to open up would solely be techniques, techniques, techniques and things of that nature. A place where you could use your own vision, and not be influenced by somebody from 1717. You have your own mind, your own thought process and my goal is to give you the tools to bring out whatever it is in you, that you want to portray to the world. Whatever that may be. I’m not here to indoctrinate anyone in anything, I’m here to give you whatever you need to bring forth what you want the world to see. SnS: Do you have a favorite artist or two? Someone whose work inspires you. James: Duane Hanson. I saw his work in my Modern Art class. It was so cool because it was like very realistic. Not only realistic, it had LIFE. Like when you look at his pieces you couldn’t tell that they were not living people. James: I love going outside, which I haven’t done a lot of since I got to Spokane. I’ve been too busy with school and trying to keep my head above water. But growing up, we’d go visit my grandfather’s farm out in N. Carolina during the summer. I loved it all: the trees, the chickens, the dogs, the cows. I like to get out to the woods. SnS: If you could travel anywhere for art inspiration, where would you go? James: I don’t know. Hmmmm. I love the sculptures in Greece and Rome. I love the realism in them even though some, like the David were sculpted to be a little proportionally off. That’s because they were meant to be viewed from a lower position, forcing you to look up. So I understand that. I’d also love to travel to Central America to see the Olmec sculptures. SnS: Okay, what if you could travel through space or time? Where would you go then? James: Well, this will sound cuckoo crazy and weird but it’s true. There’s this civilization called the Muu civilization that pre-dates all of what we call factual history. I would love to see that. See these people, see what they did, and how they did it. Half of their civilization is under water, and it’s like giant monolithic structures. So I wonder, who were these people? If they had the skill to make that level of structures, then I bet their sculptures were even more wonderful. SnS: Anything you want people to know? James: I’m currently accepting commissions for portraits or sculptures. I’ve done a lot of personal commission work here. Mostly dogs, and I love dogs so that’s not a bad thing. I just need a picture of the head, from the side and top, and the front, and a view of the body and I’ll make it just like it is. I prefer to experience the dog in real life, to understand its personality so I know who he / she is so I can build that in too. SnS: Excellent. Thank you for sharing your time and talent, James. #TBT – Glad I hired a local artist for my book cover!